Dairy farmers face reduced milk yield and poor milk quality due to high somatic cell count (SCC). 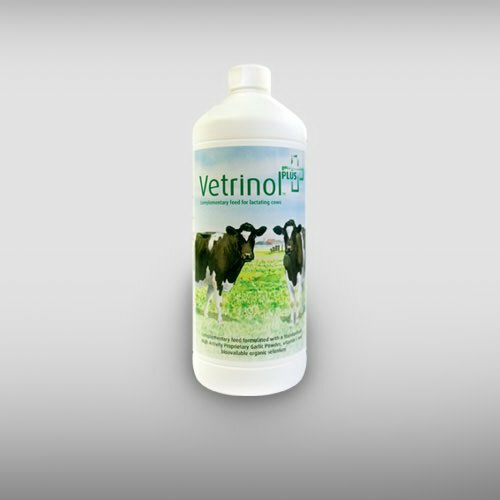 Vetrinol™ Plus is a complementary feed that improves the wellbeing and performance of lactating dairy cattle by lowering high SCC and helps lessen the reliance on antibiotics. Produced according to GMP+ standards it contains a standardised high activity propriety garlic preparation with high allicin content, bioavailable selenium and vitamin E. Vetrinol™ Plus is the second generation Vetrinol™ and it promotes enhanced efficacy and potency due to the synergistic action of compounds. InQpharm firmly believes that antibiotics are necessary tools to protect livestock health, but they are just one of many tools used and must be used responsibly to protect the health of animals as well as the safety of food supply. Antibiotics are best suited to treat diseases while our products are a natural solution to prevent health issues arising and to treat non life-threatening conditions. All our products are formulated with specific ingredients to address specific health conditions.